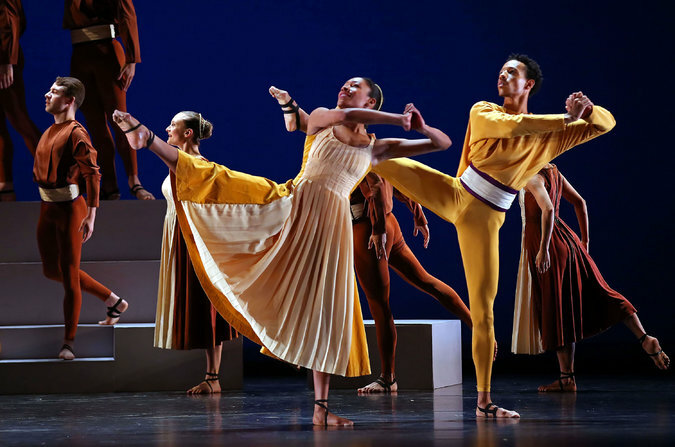 The dance company founded by Paul Taylor in 1954 returned for their annual season (March 10-29) to the former New York State Theater, but it returned under a different name: Paul Taylor’s American Modern Dance Company. This is significant. New to the company’s title are the words American and Modern. Taylor, now 84 years old and considered the surviving grand master of American modern dance, appears to be concerned about the health of his chosen genre. With his company’s new title comes a new mission: to present works by other choreographers, whether living or departed, who are part of the American modern dance family tree. Now comes the first problem. What is American modern dance? John Martin, the first and longtime dance critic (1927-1962) of the New York Times, described American modern dance as a genre developed from the movement style of a choreographer, who creates a training technique in service of that style, whose body of work is broadly in defiance of 19th century academic ballet traditions (aka romantic stories, pointe shoes, prettiness), and whose subjects are contemporary (be they social, political, or cultural). Now comes the second problem. Today, performers who identify themselves as modern dancers take ballet class. Today, choreographers who identify their work within the modern dance tradition don’t feel compelled to create a training technique, and they make commissioned work for ballet companies. Lastly, the social commentary implicit in dance theater is less in fashion in the U.S.A today than it has ever been. That said Taylor fits snugly into John Martin’s definition. He disdains ballet. He has a training technique. His muscular style is inimitable, especially with its signature arms. (They are redolent of the 1937 Rockefeller Center statue of the god Atlas holding the earth aloft his shoulders.) Taylor works alternate between light-hearted and darkly eerie visions of American behavior. With all of this said, it make sense that Taylor and his advisory team chose Doris Humphrey’s Passacaglia (1938, set to J.S. Bach) and Shen Wei’s Rite of Spring (2003, set to the four-hand Stravinsky recording) to launch his company’s new initiative of showing important 20th century modern dance works. Both Humphrey and Shen’s works fit Mr. Martin’s definition of modern dance, more or less. Shen’s Rite of Spring, as performed by 16 members of his company, is individualistic firstly because it makes no reference to the classic ballet version: Nijinsky’s Rite of Spring (1913)—in which a maiden is danced to death. Notably Taylor’s Rite of Spring (1980) doesn’t have a sacrificial dance scene either. It includes gangsters and a stolen baby, and is very much in the tradition of film noir (which he grew up on). Shen’s version brings to mind the Cultural Revolution, which he was born into, and which made mass conformity, both of the arts and its people, an ideology. 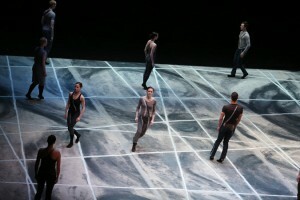 As if expressing this matter, Shen’s set design is composed of horizontal and vertical intersecting lines of chalk, made on the stage floor, that form cells. They appear to imprison the dancers. Behaving alternatively as robots and then madmen and women, who violently throttle themselves to the floor, the dancers in Shen’s world enact oppression and violence. Yet they never emote. The impersonality of their action is what makes the work so dramatic. Kristen Foote and Durell R. Comedy with other members of the Limón Dance Company. Humphrey’s Passacaglia—set to J.S. 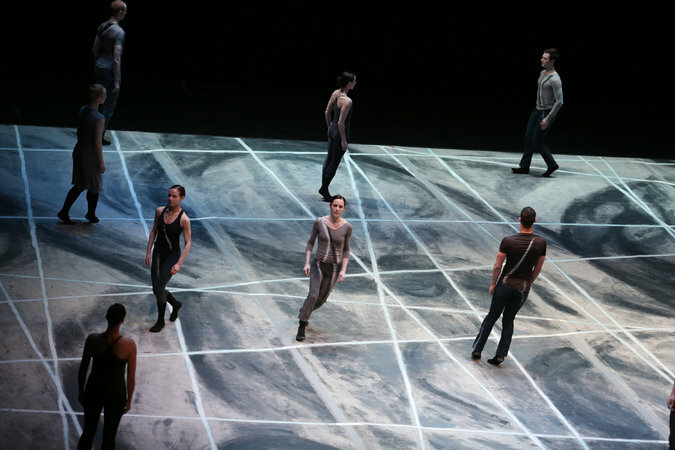 Bach, played live by organist Kent Tritle, and performed by the José Limón Dance Company—presents the group as an interlocking organism, where there may be a hierarchy, as delineated by the set design of different level blocks, but it is one that seems democratically elected. Humphrey stated that her favorite composer was J.S. Bach. Taylor has choreographed 17 works to the composer. His most popular Bach work Esplanade (1975) is performed every season and clearly is a celebration of the group. While Humphrey’s group is noble and utterly well behaved, Taylor’s group is composed of young people, who frolic, fall in love, fear, loath, and hurt. Taylor’s sociology is more expansive than Humphrey’s, but he seems to show in his choice of this work that he feels indebted to Humphrey. Unlike Taylor’s other mentor Graham, who famously said “the center of the stage is wherever I am,” Humphrey’s group dances show again and again the individual in the group. This is an inclusive vision. Taylor’s American Modern Dance Company is trying to do a similar thing with its programming of modern dances by other choreographers. No doubt a family that sticks together has a better chance of survival. This entry was posted on Sunday, April 19th, 2015 at 8:06 pm	and is filed under The Torn Tutu. You can follow any responses to this entry through the RSS 2.0 feed. Both comments and pings are currently closed.